Another day, another channel consolidation play! Independent pharmacy group American Associated Pharmacies (AAP) and drug wholesaler H.D. Smith are forming Arete Pharmacy Network, a joint venture that combines the organizations’ respective pharmacy services administrative organizations (PSAOs): H. D. Smith’s Third Party Network and AAP’s United Drugs. Click here to read the press release. PSAOs are crucial but little-known intermediaries that operate between pharmacies and pharmacy benefit managers (PBMs) in our complex U.S. drug channel system. 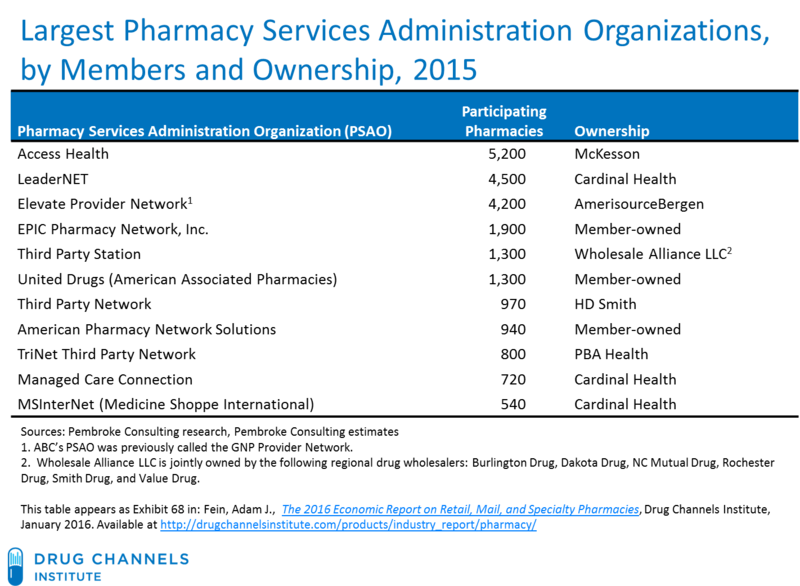 Arete Pharmacy Network is now the fourth-largest PSAO, just behind the PSAOs operated by the Big Three wholesalers. See below for our list of the top 11 PSAOs. Our research on industry consolidation has highlighted the three key options for smaller players: Get Big, Get Focused, or Get Out. Expect this unexpected deal to trigger even more novel combinations. Read on what comes next. Large pharmacies interact and negotiate directly with PBMs. Nearly all smaller pharmacy owners, however, participate in a PSAO to leverage their influence in contract negotiations with PBMs and other third-party payers. A PSAO gives a group of independent pharmacies access to managed care and PBM contracting advantages that are normally associated with large, multi-location chains. Section 5.4.3. of my new 2016 Economic Report on Retail, Mail, and Specialty Pharmacies reviews the key benefits that PSAOs provide. These benefits include pooled contractual negotiating power, centralized claims payment, and reconciliation of prescription payment activity. The chart below presents our latest list of the top PSAOs. The biggest PSAOs are operated by the biggest wholesalers, thereby providing a negotiating advantage for smaller drugstores. The wholesalers operate PSAOs as a service for their smaller pharmacy customers. 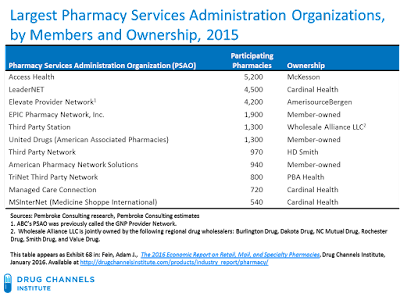 We estimate that over the past few years, the PSAOs operated by McKesson and Cardinal Health have gained members. AmerisourceBergen’s PSAO, which recently changed its name to the Elevate Provider Network, has shrunk. Almost 20 years ago, I coined a simple phrase to describe the strategic options available in industries that are consolidating: Get Big, Get Focused, or Get Out. PSAOs are crucial for smaller pharmacies that want access to preferred network models with such payers as the Medicare Part D program. See How the Eight Biggest Retail Chains (and Independents) Are Participating in 2016's Part D Preferred Networks. PSAOs’ scale contributes to the relative stability of independent pharmacies’ prescription profit margins. See Independent Pharmacy Economics: Profits Steady, but Sales Down (Maybe). Some PSAOs even tout their ability to increase reimbursement relative to contracts between a single pharmacy and a PBM. Unfortunately for pharmacy industry lobbyists, the presence of big PSAOs undermines their arguments about lopsided negotiations between giant PBMs and small pharmacies. As in any other alliance, PSAOs have their own set of risks and rewards. The multitude of stakeholders–other owners, wholesalers, and the PSAO itself–creates the possibility that effective strategic planning processes can be hijacked by organizational politics and differing objectives. Oh well. Life is full of tradeoffs. The fragmented PSAO sector is long overdue for consolidation. Payers want to build networks with broad access and a national footprint. Expect this deal to trigger more second-tier PSAOs to combine. Answer: None of the above. Ah, they mean this Arete. Cool. Best of luck, noble Aretologists!